Day 4 of the 2018 World Cup began as expected (more or less) as Serbia beat Costa Rica thanks to a beautiful Kolarov free kick. What happened later was a bit more surprising: Mexico stunned Germany with a Hiring Lozano goal, while Brazil couldn’t capitulate on a wonderful goal by Coutinho, dropping two points against Switzerland in a 1-all draw. The big upset of the World Cup only if you haven’t been paying attention to this Mexican team. 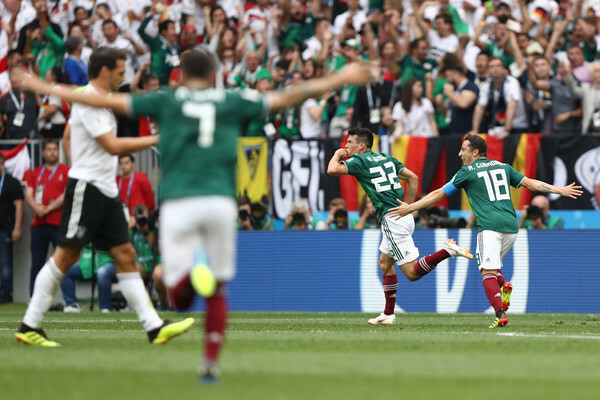 Hirving Lozano scored the only goal in one of many El Tri counter attacks that exposed the poor preparations and positioning of the German team, which finds itself in a similar position to that of previous defending champions such as Italy, France and Spain, who failed to make it out of the group stage after winning the tournament 4 years prior. Hector Herrera and Andre Guardado bossed the midfield, Guillermo Ochoa was terrific in between the posts and Joachim Low looked helpless once his initial plan to attack through Joshua Kimmich was thwarted. A dominant for the most part performance by Serbia, utilizing their physical advantages and especially their midfield’s quality to control their first World Cup match in 8 years and set themselves up for at least a second place finish in a difficult group. Kolarov scored a beauty of a free kick, and if it wasn’t for some wastefulness up front, the scoreline would have been much more convincing. For Costa Rica, it seems that the magic of four years ago, despite the efficiency of Keylor Navas in goal, is not going to repeat itself. Like Joachim Low, it looked like Tite, Brazil’s head coach, was completely caught off guard the moment his initial plans stopped working. Switzerland played very aggressively and didn’t let the wonderful Coutinho opener get them down. They equalized early in the second half through Steven Zuber, and defended bravely from that moment, including some impressive saves by the defenders and Yann Sommer himself in injury time. If we thought this group was going to be Brazil and 3 more teams, turns out that just like in Group F, we were way off the mark. The man behind the impressive performance by El Tri. The man who changes his tactics and formations on a match to match basis. The man who kept 3 Mexican players up front at all times to keep the German defense on its heels. The first Colombian head coach in charge of a side that loves changing its men on the lines showed an experienced and arrogant world champion that he needs to step up his game in Russia. The current Barcelona midfielder scored quite a few of those curlers while playing for Liverpool. 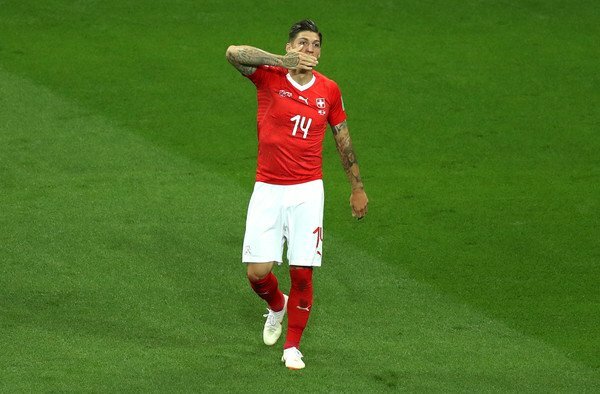 His moment of brilliance ended up being Brazil’s sole moment of pride in their draw with Switzerland, but this could end up being the goal of the tournament, regardless of how it all ends for the selecao. 1 goals: Artem Dzyuba, Yuri Gazinsky, Aleksandr Golovin (Russia), Jose Maria Gimenez (Uruguay), Nacho (Spain), Paul Pogba, Antoine Griezmann (France), Mile Jedinak (Australia), Sergio Aguero (Argentina), Alfred Finnbogason (Iceland), Yussuf Poulsen (Denmark), Luka Modric (Croatia), Aleksandar Kolarov (Serbia), Hirving Lozano (Mexico), Philippe Coutinho (Brazil), Steven Zuber (Switzerland).